All fats are composed of molecular building blocks called fatty acids. These fatty acids can dramatically affect human health depending on their blend, mix and balance. It is well known that saturated fats are bad for us. Found in many foods including meat, dairy products, and some tropical oils, saturated fat increases the risk of coronary artery disease, diabetes and obesity. Recently, another culprit has been identified - trans fatty acids, which are man-made molecules produced during the hydrogenation of vegetable oil. Studies show that trans fatty acids can be even worse for your cardiovascular system than saturated fat and may also increase the risk of breast cancer. Unfortunately the typical Western diet is loaded with the types of fatty acids that seem to be linked with some of our most serious health problems, and significantly deficient in some that are essential for proper nutrition. It now appears that switching from butter to a vegetable-oil based margarine may not have been such a great idea. Mono-unsaturated fatty acids, the type found in olive oil and canola oil, have properties that appear to help protect the cardiovascular system. They also seem to reduce the risk of certain metabolic disorders such as diabetes and have been linked to lower rates of cancer. Polyunsaturated fats can be good for you as well. They contain EFAs, or "essential fatty acids." These EFAs are fatty acids that are necessary for normal growth and development, yet cannot be manufactured in your body. They must be obtained from our food. The two types of EFAs in polyunsaturated fat are Omega-3 and Omega-6. For these EFAs to be produce maximum nutritional benefit they should be evenly balanced. 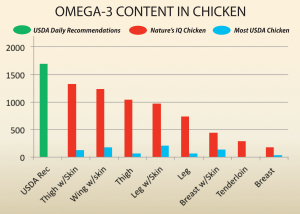 Unfortunately the Western diet is overloaded with Omega-6, and very slim in Omega-3. 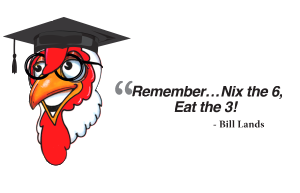 Belovo and IQ Chicken are committed to providing a more nutritious option in meats with an extraordinary level of Omega-3 and a proper balance between Omega-3 and Omega-6. 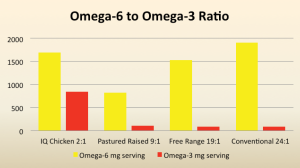 Since the industrial revolution of the midst of the 19th century, we have had a tendency to consume more saturated and less polyunsaturated fatty acids, and the latter are nearly exclusively represented by those of the omega-6 family. 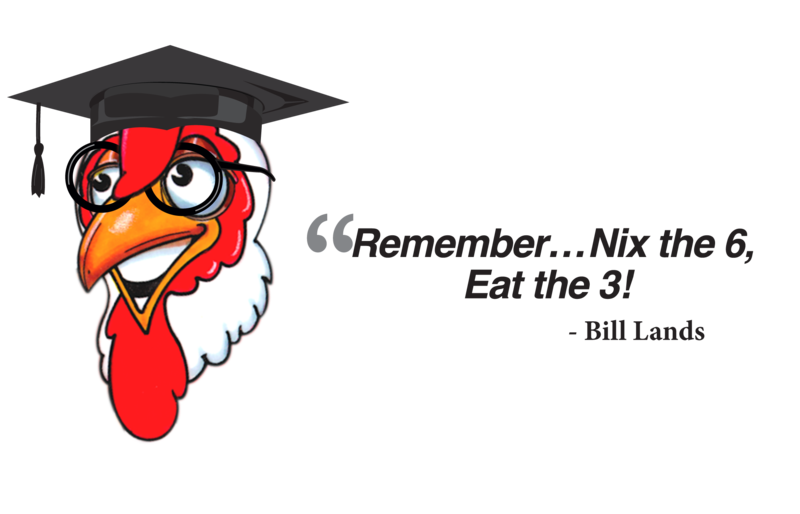 As a consequence, our diet is largely deficient in omega-3 fatty acids. In the meantime, our genes have not changed and, in fact, our genetic profile is very similar to that of our Paleolithic ancestors. What recently came to light is that most modern degenerative diseases and morbidities which we will/or may eventually suffer, find their roots in the extent to which your dietary lipids have deviated from their original make-up. 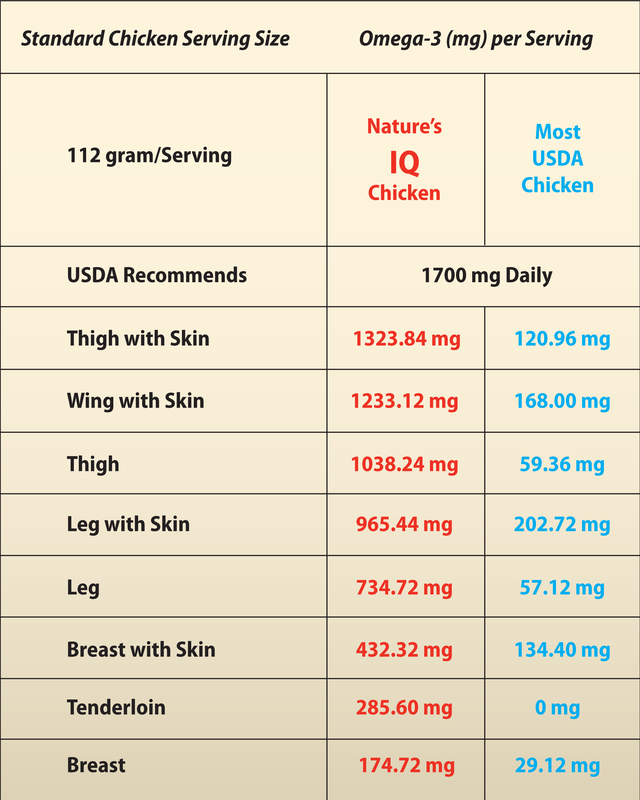 This chart pictures a comparison between IQ Chicken and most other currently available chicken meat, along with the USDA daily recommendation for Omega-3 intake. 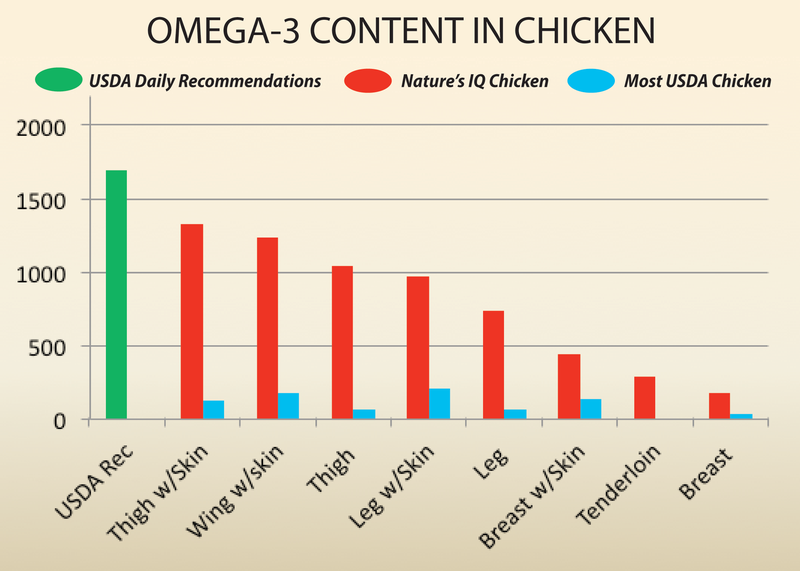 And this chart shows the ratio of Omega-6 to Omega-3 in IQ Chicken and other currently available chicken meat. 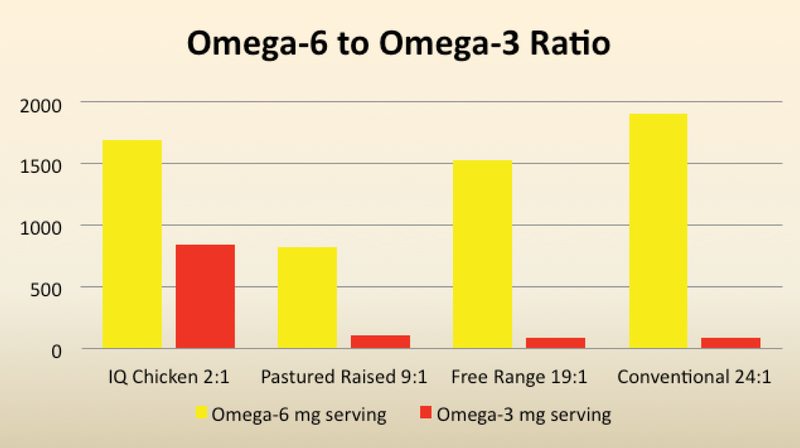 Keep in mind, the ideal target ratio is 1:1 - Omga-6 : Omega-3, so the closest you can come to that ratio, the more improvement you are making. 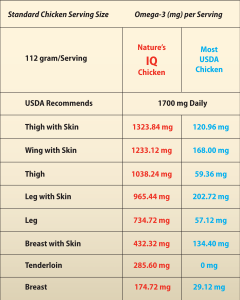 Remember, feed for IQ Chicken is a unique, all natural, patented diet with twenty grains and vegetables that not only improves Omega-3 concentration, but produces meat that tastes great too!